Nietzsche is the natural successor of Schopenhauer where the former turned the latter’s conclusions upside down; in World as Will and Representation, Schopenhauer observes that it is the “will-to-live” that is responsible for our drives, moods, and individuation. However, the will-to-live is aimless beyond basic desires, absent of good & evil/without morality, and wholly irrational; his ethical conclusion however is the abnegation of life (will as evil) as such striving by the will can only result in the suffering by the ego. Schopenhauer quotes, “Man can indeed do what he wants, but he cannot will what he wants”; much of later Psychoanalysis that began in the latter half of the 19th century will redress this problem as the denial of life itself would result in the very extinction of the human species! No doubt, psychoanalytic concepts such as the Freudian libido and the unconscious were influenced by these ideas. Prior to this, the first to radically address Schopenhauer’s solution (asceticism as “will-to-nothingness”) was Nietzsche; the problem of nihilism is posed where the Western man is at a loss of values/meaning (another definition derives from the non-distinction of dualistic extremes). Nietzsche’s answer to nihilism originates with Greek tragedy where art, emerged from the tension between the Apollonian-Dionysian (order-chaos) dichotomy, transforms human suffering into a passionate affirmation of life. Subjectivity collapses back into the will-to-life (“Primordial unity”, Dionysian) and exaggerates it (frenzy); order re-emerges (Apollonian) to give the energy form (art). Such an act of destruction-creation (creative-destruction) puts man into the continual state of flux/becoming, of joy-sorrow, and of gain-loss. To affirm life is to recognize such a duality best summarized by amor fati or to love fate. The procreative tendencies of affirming life produces conflicting power centers that are in conflict. The Apollonian impulse to organize these centers produces a higher-order of complexity that in man, emerges as consciousness (Ego) for ordering the power-struggle; observation of this phenomenon by the ego is dubbed Will-to-power. Nietzsche uses this concept to explain his moral theory, or rather the rejection of normative ethics on the grounds that individuals of different will-to-power are sufficiently different (degrees of power constitutes standards for value). Master-morality is the morality of the strong-willed where man experiences himself as determining his values (he is creator of values); his view is consequentialist in sense that what is harmful/helpful for me is bad/good in itself. This is in contrast to slave-morality which reevaluates the values created by the masters. His view accords right/wrong by intention rather than consequences; value is accorded according to the greatest utility for the whole community. It is no surprise that Nietzsche criticizes Christianity as it preaches universal brotherhood or egalitarianism. At the far extremes, the master who acquires the power to overcome nihilism whilst avoiding the trappings of both other-worldliness and asceticism is the Ubermensch. 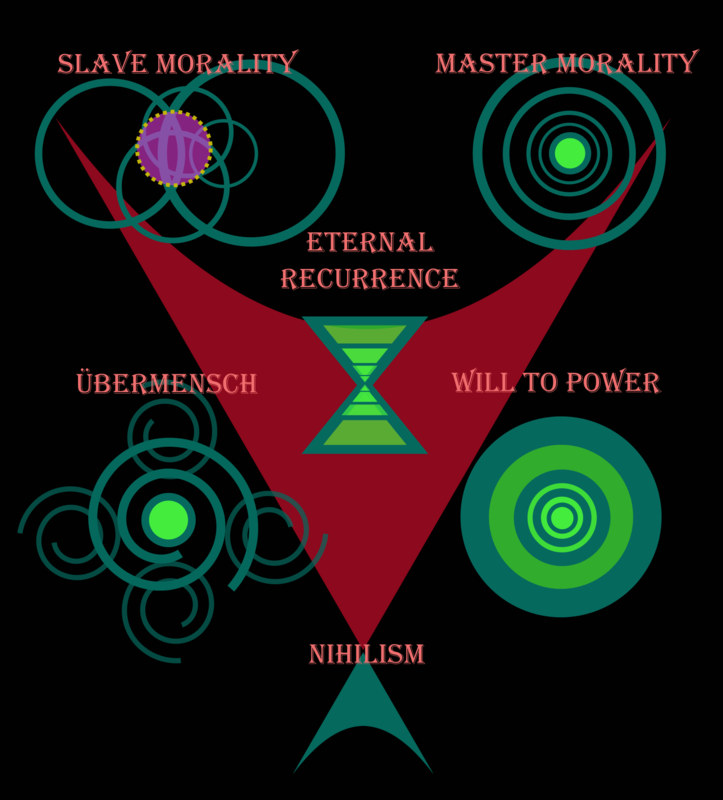 Moreover, the Ubermensch is able to will the “eternal recurrence”, the nihilist extreme that all that has happened before will happen again ad infinitum (non-uniqueness of events itself!). Such a figure is the posited as a goal for humanity to strive towards (human as a bridge between animal and the Ubermensch) and represents Nietzsche’s answer to nihilism. Unfortunately, history’s reaction to this answer was disastrous (two world-wars to boot); this remains the ongoing problem for modern man that all later philosophers will have to address.